How Much Should Your Car Down Payment Be? If you need a new vehicle, you know that there is a lot of financial decisions to be made in addition to picking out a suitable make, model, and year for your needs and preferences. Deciding to purchase a vehicle is a big decision, but deciding how much to spend as a downpayment shouldn’t be. As a general rule, you should be prepared to pay at least 20% of the vehicle’s sticker price upfront. For a $30,000 vehicle, this means you should have at least $6,000 saved and ready to spend. For a less expensive vehicle, say a $10,000 one, you should still have at least $2,000 ready to spend. It might seem like a big chunk of change, and it is. But although you may see flashy and tempting offers to pay 0 percent down up front, you should do everything you can do to avoid these options. Why Do I Need To Pay At Least 20 Percent? There are so, so many reasons – here are a few of the biggest ones, listed here in order of priority. If you are buying a new vehicle, it is critical to pay at least 20 percent down payment, and it still may not be enough to avoid this common pitfall. The minute you drive a new car off the lot, it loses approximately 10 percent of its value, and you can expect the value to go down another 10 percent in the first year. If you have made less than a 20 percent downpayment, that means you will be underwater on your loan before you have even really gotten to appreciate your vehicle or make good progress on paying off the loan. And don’t even think about putting 0 percent down. With sales tax, interest, and applicable fees, the cost of your loan will be more than the car is worth before you drive it off the lot. Pretty scary, right? If you wreck your vehicle and it is totaled, your insurance company will likely cover the amount the car is worth – which could be substantially less than the amount you owe on your loan. Generally, you can purchase gap insurance to cover the difference between what you owe and what the car is worth, but it’s a much better idea to avoid getting into this situation in the first place. If being underwater on a loan does not scare you, maybe missing out on the best loan terms in the first place will. Interest rates for loans (and approval in the first place) are based upon your calculated likelihood of being able to pay back the loan over the course of its term. 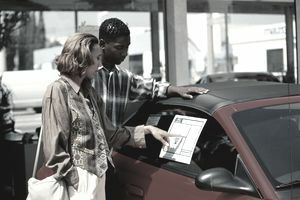 If you make no or a low down payment, that’s a signal to financial institutions that you might not be able to afford the vehicle you purchased at all. To avoid losing money on you if that happens, financial institutions will likely offer you a higher interest rate than they would if you had made a higher down payment. If you have low credit and you apply for a loan, you might not even be approved without making the 20 percent down payment. Of course, putting more money down upfront means that you will owe less on your car loan month-to-month. This can be very helpful to your budget and can allow you to save up for other financial goals. What If I Can’t Afford A 20 Percent Downpayment? If you can’t afford the 20 percent down payment in cash, there are a few options you can consider. Most obviously, the trade-in value of your old vehicle can count towards your down payment. Even if you are trading in a junker, a few thousand dollars can go a long way towards meeting your 20 percent mark. If you can’t afford the down payment at all, leasing a vehicle is a great option that will keep you on the hook only on a month to month basis for a short period of time, usually for a few years. This is a great option if you have good credit but not a ton of money in the bank. You can save up for the vehicle of your dreams while still driving around a car that meets your needs while you do so.